I have been tasked with keeping a secret over the past few months—which is sometimes difficult for me, as I have trouble remembering what has been told in confidence. However, Lewis told me a secret so big, I almost blabbed for the mere fact of how utterly exciting it is. Are you ready for it? AirGon has developed a direct geopositioning Post-Process Kinematic (PPK) system for the DJI series Inspire 2 and Phantom 4 Pro drones! Dubbed LOKI, this PPK system is a third generation AirGon design that uses the latest Septentrio GNSS engine, the AsteRx-m2. The m2 is a triple band GNSS engine, supporting NAVSTAR GPS L1/L2/L5 and GLONASS L1/L2/L3 and sporting 448 hardware channels. The GeoCue engineers tell me this is the most advanced UAS class receiver on the market today. LOKI is self-contained and uses an internal battery (charged via a USB port). It has been designed to survive most crashes and easily can be moved to a new, replacement drone. LOKI interfaces to the DJI series drones by simply plugging a personality cable into the DJI drone SD card slot, making it a user installable “plug and play” system. We use a patent-pending set of hardware and firmware algorithms to figure out when the camera is triggered. Should users elect to use a higher end drone with a DSLR camera, the LOKI system can be moved by simply using a DLSR personality cable. LOKI provides a huge advantage over using drones without RTK/PPK. Without direct geopositioning, dense ground control is required to achieve the accuracy necessary to calculate differential earth works volumes and to create 2’ (60 cm) or closer contours. This can be extremely time consuming and sometimes a safety issue. In fact, on some sites ground control cannot be placed due to restrictions to site access. However, joined with the BYOD Mapping Kit and a base station, users can expect around ⅛ foot horizontal and ¼ foot vertical accuracies with no ground control placement. The system is scheduled for release in late July/early August. Please contact us at info@airgon.com for more information on LOKI and the BYOD Mapping Kit. I am currently attending the 2017 NSSGA/CONEXPO exposition. One of the keynotes from the National Stone, Sand and Gravel Association (NSSGA) conference focused on the rate of change of technology in the mining industry and the scope of operations that are covered by these technologies. Of course, one of the examples was the use of drones. The gist of the discussion was that some of these technologies are in their formative stages; we do not yet fully appreciate the scope of operational affect they will have but to prosper, knowledge of these systems must be internalized. One thing is very clear – frequent and repetitive mapping will be required to support the automated machinery that is now appearing on advanced sites. You cannot program a haul truck for autonomous operations if you do not know the location of the road! Complicating this issue is the fact that the road location changes nearly daily due to the operation itself. This future trajectory says that mine site mapping will need to become an internal operation. It will be impractical from both a logistics and cost perspective to outsource drone mapping services. A second strong consideration is the rapidity with which drone technology is changing. I think amortizing the cost of a drone over more than 12 months is just not realistic. Drones are simply platforms for cameras and other sensors (for example, profilers, laser scanners and so forth). A drone without a sensor is a fun toy to fly but it is not going to have much use in operations! I am very excited about new platforms from commercial drone companies (mostly DJI). These new drones include decent cameras in that they now incorporate larger sensors and hybrid shutters. You can do a reasonable job of mapping with these yet still use them for inspection videos. So I think what we are seeing is the beginning of the end of the purpose-built drone. You will be able to purchase drones from DJI (and perhaps others) that are nearly a consumable. You can use the same drone for inspections as you use for mapping. This is a very important consideration since this greatly simplifies the training of users. The bottom line here is this – we are seeing the beginning of drones as an everyday tool for mining, industry and construction. The proper model is going to be internal control of not only flying the systems but also processing the data. When you need a quick check of a pulley on a conveyor, you will want an internal staff member to quickly fly the inspection job and post the resultant video. No need to have a third-party system or contractor involved. It just complicates the flow and adds expense. 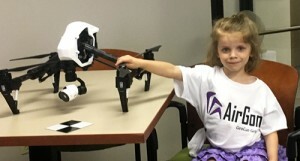 This is really the motivation behind our Bring Your Own Drone (BYOD) Mapping Kit. 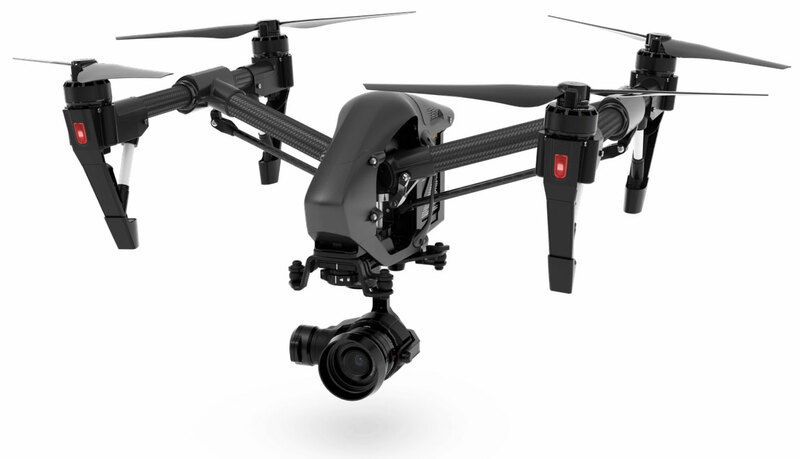 It lets you use a low-cost drone such as the DJI Inspire to do serious mapping without a lot of complicated leasing or outsourced data processing arrangements. It also allows you to use the same platform for inspection that you use for mapping. Give us a call to see how well this solution will meet your specific needs. Bring Your Own Drone (BYOD) Mapping Kit, a collection of software that enables serious mapping with a variety of third party drone hardware from low cost DJI Inspires to professional grade senseFly (eBee) fixed wing drones. Network Partners – The AirGon Network program is an emerging part of our AirGon business. It comprises drone mapping services experts who use our technology for data capture, processing and delivery. Network Partners always interact with their AirGon Network client base via Reckon. We offer regular best practices training, exposure to end-use customers and referrals. We can also provide data processing services to those who wish to focus only on flying. This is a program that requires qualification. Enterprise Partners – These are end use customers of drone mapping services. An AirGon Enterprise Partner can be as small as a single stockpile yard to as large as a multi-national mining company. Enterprise partners generally engage with us via our CONTINUUM concept, a model that allows a customer to tailor a drone mapping solution that exactly fits their desired business model. For customers who wish to do their own data collection, we offer subscription-based back office processing services. For customers who want to outsource data collection and processing, we link Network partners who are the best match for the desired services and locations. Please get in touch with use (info@airgon.com) if you are serious about high accuracy drone mapping – we would love to work with you! I am excited to give you a preview of the AirGon Bring Your Own Drone (BYOD) Mapping Kit. What better way to introduce a small, low cost approach to mapping than with our BYOD Marketing Rep, Molly. OK, OK a bit of nepotism – she is my granddaughter. The BYOD Mapping Kit is a collection of software and training that allows you to do mapping with a low cost DJI drone. Currently the Phantom and Inspire platforms are supported with the new DJI Mavic soon to be added. The kit is priced at US $7,990. Just add your own low cost DJI platform and you are in the mapping business! This is a great way to get your feet wet with drone mapping. While this kit is suitable for service providers who want to start out with a conservative approach to drone mapping, it is also a great way for owner/operators to experiment with the viability of this approach to data analysis. For example, we have been working extensively with a paper mill who uses the BYOD with an Inspire to produce volumetrics for wood chip and log piles. Another example is an asphalt shingle company who is measuring volumes of raw and processed shingles with a Phantom. Now granted, you are not going to collect accurate 1 foot contours with a Phantom but you can do some serious analytics that are good enough for many estimation purposes. This initial BYOD Mapping Kit requires an Apple iOS device (iPhone or iPad) for the autopilot. We will be adding an Android option by Q1 of 2017. Of course, you could assemble this yourself by individually acquiring the components. However, the most important aspect of the BYOD Mapping Kit is the on-going training you will receive as a member of the program. We have performed over 250 site mapping projects in the past year and have learned what does not work (almost everything!) and what does work. For example, you will not get anything close to correct without a process for focal length determination (no, it is not what is written on the lens! ), elevation bias removal and a number of other tricks. Our paper mill customer was experiencing volumetric errors of around 25% using a mainstream point cloud/basic volumetric tool prior to engaging with us. We did some diagnostics on the process and improved their accuracy to within 5% of reference (reference was a very high accuracy survey conducted by AirGon using our AV-900 helicopter with PPK and survey ground control). In fact, one of the errors is a transformation problem within the DJI recording software itself. I can assure you that the BYOD Mapping Program will provide a very rapid Return on Investment via the training alone. 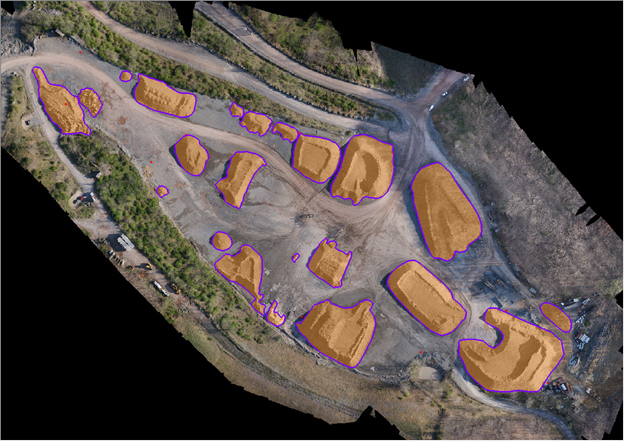 If you decide to move up to a survey grade drone, the PhotoScan and Topolyst software remain the best possible solution. Thus your total investment is preserved as you migrate to more capable systems. If you just want to collect data but do not want to do routine data processing, no problem. We can do direct data processing for you via our AirGon Services Group or direct you to one of our AirGon Partner Program members. If you are interested in becoming an AirGon BYOD Mapper, contact Ashlee Hornbuckle at ahornbuckle@airgon.com. She will be happy to share detailed information on this program with you. This has been a very busy time for our AirGon subsidiary. While our primary focus is delivering hardware and software tools for high accuracy drone mapping, we also provide a limited amount of services. These services have been extremely helpful in providing a test bed for our positioning and processing tools. We continue to test and provide feedback to our LP360/Topolyst software development group regarding tools for improving the overall workflow experience. We run in to all sorts of complex modeling situations and we try to assess each in terms of tools that would ease and/or improve the workflows. For example, you will see a new tool to extract 3D vertices from line work in the latest EXP release of Topolyst/LP360 (standalone). This tool has been added to assist with modeling Low Confidence Areas (LCA) common to point clouds derived from Structure from Motion (SfM) algorithms. 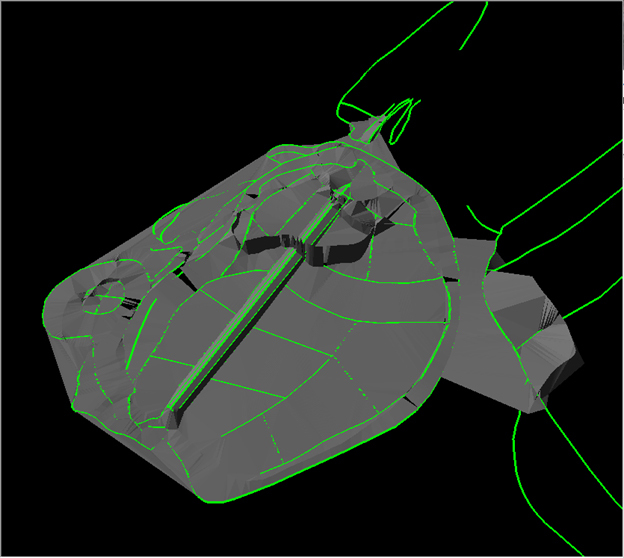 Another recent edition to LP360/Topolyst (all versions) is a new contour smoothing algorithm. This algorithm is designed to address the problems of meandering contours in areas of small vertical change (the meanderings are caused by either surface or algorithm noise). You will find that this new tool greatly enhances the appearance of contours in these problem areas. A typical meandering contour is depicted in Figure 1. 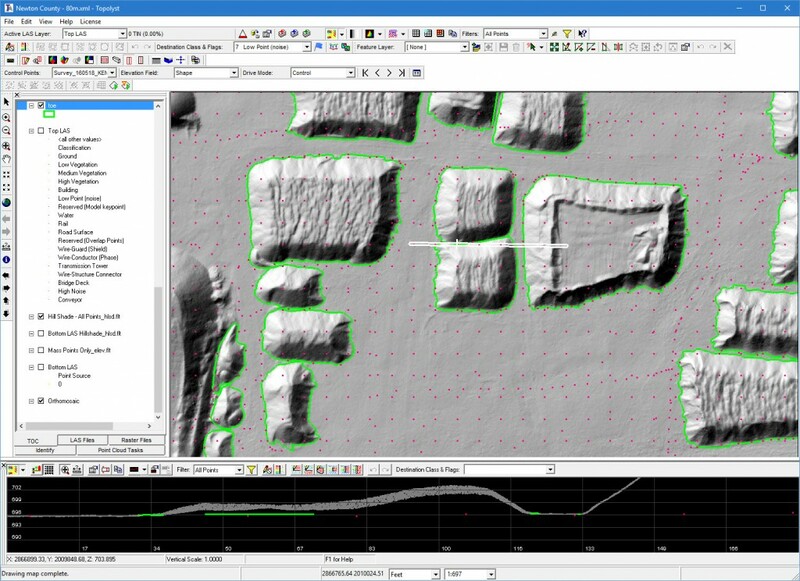 This same map area after processing through the new smoothing algorithm is shown in Figure 2 – a dramatic improvement! Our algorithm works in model space (the model on which the contours are based) and hence is guaranteed not to introduce topology errors such as contour crossings. We have been doing a lot of experiments lately with very low cost drones and cameras (for example, the Inspire Pro) as to their suitability for volumetric mapping. The results so far are mixed. We have discovered that, when using no control (an approach often used by folks not well versed in survey grade mapping) that an error in the a priori heights fed into SfM software will result in significant scale errors. These scale errors are not immediately evident since all of the data look terrific! I hope to be publishing a report on this within the next 60 days. We did our first flights under the new Part 107 rules. We were collecting data near an airport in Class G airspace (something we could not do under the old Section 333 waiver without a special COA). We always carefully monitor air traffic via a VHF radio. At one point we heard a pilot declare “I see a drone down there over the mine site!” This is perfectly OK under Part 107 but takes a bit to get used to! 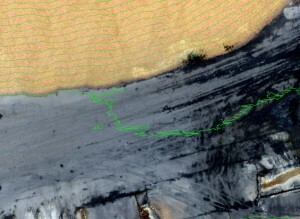 We are concluding that if you need point clouds from imagery (dense image matching, DIM or Structure from Motion, SfM) to meet the network accuracy requirements for high grade topographic mapping (such as 1 foot contours) you are going to have to use either RTK or PPK on your flight platform. Even with fairly dense ground control, we are not seeing the accuracy levels we need without RTK/PPK (and we have tried this with different systems and cameras). We are considering a special training session later this year on drone data workflow processing using PhotoScan/Pix4D and Topolyst. We also may work with our local flight center to combine this with a Remote Pilot certification training/testing session. Drop us a line if you are interested in this. Several months ago, I introduced Topolyst, our small Unmanned Aerial Systems (sUAS) processing software. 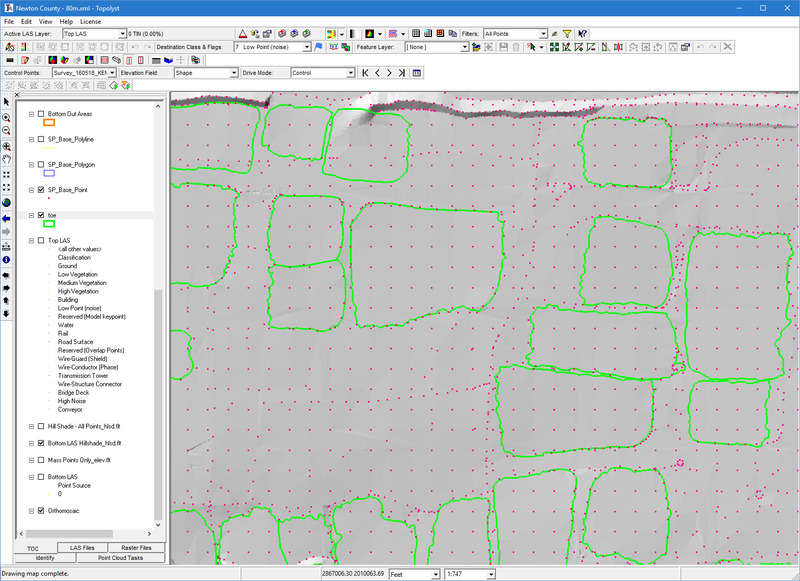 One of the great features in Topolyst are tools to automatically create the footprint (“toe”) of a stockpile and to optionally classify overhead points so that they are excluded from subsequent processing (such as cross sections or volumetric computations). An example of a stockpile with an overhead conveyor, prior to toe finding and classification, is shown in Figure 1. As seen in the 3D view in the upper right, the conveyor simply blends in with the stockpile, giving a grossly inaccurate volume for this pile. The data following Topolyst’s automatic stockpile extraction are shown in Figure 2. Note the toe in the Map and 3D views as well as the automatic classification of the portion of the conveyor within the toe. This is an extremely powerful tool available in Topolyst (or in LP360 Advanced) that reduces the work of collecting stockpile volumes significantly. Our initial release of Topolyst also includes a very powerful collection of 3D feature editing tools that make quick work of manually digitizing toes or cleaning up toes in difficult locations (for example, along pit walls) following automatic extraction. We have found, from completing many stockpile surveys, that correctly defining the toe is just the beginning! Mine site operators are keenly interested in consistency. For example, suppose a stockpile is measured on 5 January to have a volume of 1,000 yards3. The plant manager sells 500 yards3 from this pile during the period up to the next survey. She also estimates that 1,000 yards3 were added to the pile. The next survey should indicate a volume close to 1,500 yards3. If it does not, the person measuring the volume is the first suspect! What are the causes of these discrepancies? The first is, of course, poor estimation. It is much more difficult to accurately estimate the volume of a pile by “eyeball” than one might guess. However, we have found the primary culprit to be the definition of the base of the stockpile. Many mine sites keep a priori survey data that represent the terrain prior to placing any stockpiles (“baseline data” or simply baselines). 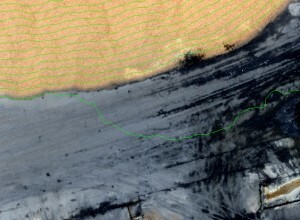 Nearly all of the baseline data provided to us has been stereographically collected from a manned aerial survey. An example is shown in Figure 3. 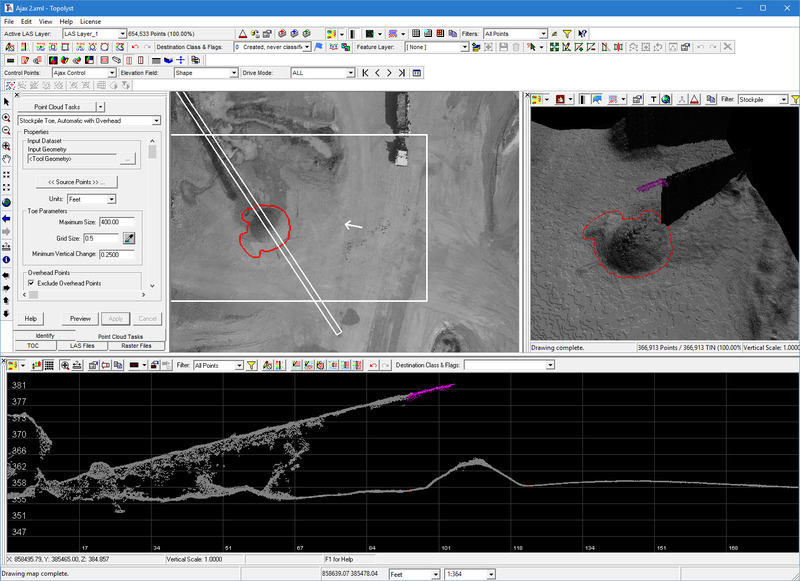 The magenta points are 3D “mass points” that were derived from a conventional photogrammetric stereo model. Get the mine site owner to agree to use the true surface at the time of data collection and abandon the use of “baseline” data. There is a lot of argument for this since it is seldom that the subsurface material will be used. However, a big one time inventory adjustment may have to be made. Generate a surface model from the baseline data and then use the toes to only define the planimetric placement of the stockpile. The third method probably gives the most consistent change of volume record from survey to survey but is it the most technically correct? This method assumes that all of the material from the toe to the baseline (recall that the baseline is actually under the surface on which the toe lies) could be extracted and used/sold. This is usually not the case. 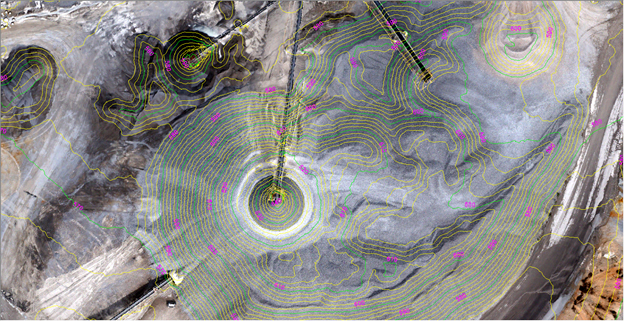 As mappers of data, it is important that we advise mine site operators of the advantages and disadvantages of the various methods but, at the end of the day, produce the data according to the customer’s instructions. Topolyst supports all of the aforementioned techniques for computing volumes (as well as a few others). For example, the hillshade of Figure 4 is a surface model constructed solely from photogrammetric mass points. Topolyst has the ability to dynamically use these data as the base where computing volumetrics. Topolyst also has the ability to generate a LAS file from point, polyline and polygon feature data. This is extremely useful since this “baseline” LAS can be used in a wide variety of analysis scenarios. The features we are adding to Topolyst are being driven by our customer needs, our own needs within our analytic services group and by our research and development efforts aimed at process improvement. I very definitely welcome your feedback on current and needed features in this great product.